Why did they come to St. Vincent? The economic conditions in India were very bad. The British had just taken over the governance of India (1850s) and the offer of contract work in St. Vincent was made to Indians. Famines in India in the 1870s also impacted on Indian emigration. Indian migration to the Caribbean had started since the late1830s to British Guyana. Consequent to the termination of slavery in St. Vincent on August 1, 1838 there was a shortage of labour as the resident workers refused to work on the estates. During the period 1839 to 1864, prior to the Indians, 1,036 liberated Africans and 2,110 Portuguese Madeirans had taken up work in St. Vincent. Typically, an Indian signed a bond to work for a period of five or 10 years at a rate of 10 pence per day after which he would be entitled to passage back to India. There were several phases of the Indian immigration to St. Vincent which was mainly dictated by conditions in the sugar market; but other factors such as epidemics in SVG and ill treatment of Indians also had an impact. When the price of sugar was good, Indian immigration increased but when the Industry suffered the Indians also suffered. For example, in 1862 when the second ship of Indians arrived, the price of sugar had fallen and the planters did not take up their share of workers and many Indian workers had to remain in the depot. The planters attempted to cut cost by lowering wages and withdrawing the weekly allowances of sugar, rum and molasses. This resulted in riots, disturbances, abandonment of estates and the neglect and abuse of the Indians. The depot where the unassigned Indians were kept was the commissariat building for the militia. By 1880 when the last ship of Indians arrived in St. Vincent and the Grenadines, the sugar market had become very competitive and planters tried to cut costs by reducing wages, increasing tasks and neglecting their contractual obligations to the Indians. The Indians were treated horribly and in 1882 the Acting Administrator Roger Goldsworthy received 82 formal complaints from Indians alleging ill-treatment, non payment of wages and other abuses. The frequency of complaints forced Governor Robinson to order an investigation. This was conducted by R.P. Cropper, the St. Lucia Protector of Indians. His report describes the horrible conditions under which the Indians had to live and work. Like the Africans, they were exploited and treated harshly by the plantation owners. However, this investigation did not make things better for the Indians. Rather, their treatment continued to worsen. Finally, on October 7th, 1882, in an effort to bring their grievances directly to the Lieutenant Governor, 50 Indians marched from Argyle to Kingstown. They protested against abuse, loss of wages, and some claimed they were robbed out of their return passage to India. The march resulted in 7 Indians being found guilty of vagrancy, i.e. going more than 2 miles from the estate. These Indians, who later came to be known as the âArgyle Sevenâ, were assisted by Barrister George Smith who petitioned the colonial office and won the case giving the Argyle Seven their right to a passage back to India. The case also exposed the sloppy way the records of the Indians were kept as they could not be relied upon to prove whether an Indian or the employer had fulfilled their contractual obligations. A decision was therefore taken by the Colonial office that all Indians who had no work or a place to live should be given passage back to India. During the period 1871 to 1885 a total of 1,141 Indian indentured workers departed SVG for India. However, many were prevented from returning due to the plantation ownersâ devious manipulation of the system. Those who could not return included those who were kidnapped as children in India and brought to St. Vincent. When the Indians went to Kingstown on August 1st, 1885 to board the last ship to India they had to walk through two long lines of armed officers or militia. This tight security was to prevent certain Indians from getting onto the ship. There were a few Indians who voluntarily forfeited their right to a return passage to India by accepting a Â£10.00 bounty offered. Many migrated to Guyana and Trinidad but those who remained in St. Vincent lived mainly on estates at Argyle and at Lot 14, near to the indigenous Carib community. The hurricane of 1898 and volcanic eruption of 1902 crippled the sugar industry and the estate system was finally broken up. A new land settlement scheme in St. Vincent allowed the Indians to move away from the estates. They settled mainly at Calder, Akers, Richland Park, Park Hill, Georgetown and Rose Bank. In 1902 the Indian population in SVG was just under 500 but by the 1950s Indians in SVG numbered over 5000. It was not uncommon for a married couple to have more than ten children. The Indians assimilated into the Vincentian community and worked alongside a melting pot of cultures: Africans, Portuguese, British, the aboriginal Amerindians or Yellow Caribs and the Black Garifuna Caribs. They were mainly involved in agriculture, manufacturing and trade. They were thrifty and hardly got involved in crime. They adopted British names and Christian religions. 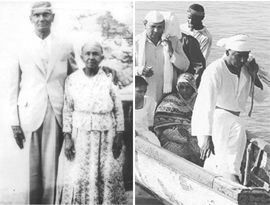 By the 1920s when the indentured labour system was abolished in the Caribbean, the Indians had integrated into the society and had made an impact on the culture of St. Vincent and the Grenadines. Curry, roti, rice and dhal were now embraced as a vital part of the Vincentian diet. There was a small amount of Indian migration from St. Vincent to other Caribbean islands in the first half of the 20th century but the latter half saw migration of hundreds of Indians to the UK, USA and Canada.